The new home of Sheffield Eagles at the Olympic Legacy Park. Cory Aston says the club aren’t thinking about a relegation battle this season, with the Castleford loanee insisting the Eagles have what it takes to climb the Championship. Aston, son of director Mark, returned to the flock on a temporary basis in the close season following his switch from Leeds to Daryl Powell’s Tigers. The Academy graduate re-joined his dad for some game time, but his presence, alongside fellow loanee Garry Lo, have failed to halt an early season slump -Eagles are rooted at the foot of the standings. Aston, whose loan is now ongoing until his parent club seek a recall, says that despite the tough start, no-one is yet thinking of a long relegation scrap. “Relegation) is not in our minds at all,” Aston said. Aston, who has played in every game this season, bagged his first try of this spell in the recent defeat to Toulouse. 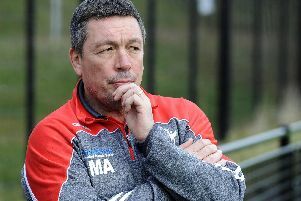 With the Eagles taking a break from what has been a difficult start to the league campaign, Aston junior believes that Sunday’s Challenge Cup tie against Barrow Raiders might just be what the club needs after a punishing league schedule. “It has not been easy,” added the 23-year-old. “Since the first game really we have had such a tough run of fixtures, so to have a break now from the league and play in the Challenge Cup isn’t a bad thing.